Here at Garage Door Repair Pleasanton, we pride ourselves in giving you only the best when it comes to garage door parts and hardware. However, this does not mean that we use the most expensive parts and pass the cost down to you, our dear clients. No, we believe that practicality is where you get your money's worth. Just because a part is expensive, doesn't mean it's the best. This is why we use hardware from manufacturers like Genie and Liftmaster, who believe that functionality does not need to come with a hefty price tag. Liftmaster is known as a brand that delivers unique solutions to specific garage door problems. While they have general opener systems as part of their product line, they also have openers with specific functions and advanced features, so if there are any problems with garage doors, they can solve it. Does opening your garage cause a ruckus that wakes the entire house? Liftmaster has a Quiet Belt Drive Opener for smooth and quiet door operation. Do you live in areas that are particularly hot or cold? The Premium Screw Drive Opener is built specifically to withstand extreme temperatures. Their products do more than just open and close garage doors automatically. They cater to your specific needs, which means potentially saving you a lot of money on upgrades. With Liftmaster, you can choose the opener that solves your particular garage door concerns, without needing to add any features that you don't wish to purchase. So in the end, you're only paying for features that you need and will use, without the bells and whistles added just to buff up the price tag. When it comes to Genie's garage door openers, the first thing that comes to mind is power. Genie has proven time and again that an opener does not need to be expensive in order to bring the needed horsepower for heavier garage doors. 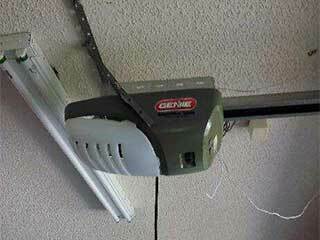 Genie is valued by many homeowners who want a powerful garage door openers at a reasonable cost. Genie's products come with a perfect balance of fast and steady opening speeds, and powerful motors. All products are assembled inside the US, and must pass several safety regulations before they are introduced into the market. All of their openers have built-in lighting systems and come with unique features like motion detection lighting and Intellicode security, depending on the model. Both Genie and LiftMaster are known for their variety in terms of product lines. At reasonable costs, you can get opener systems that are made of high-quality materials, assembled carefully by certified factories for safety, and packs a punch when it comes to motor horsepower. Best of all, different models come different sets of features that cater to your specific needs. Whether you need a quiet motor, or a heavy duty garage door opener, these manufacturers have got it covered. Contact our experts at Garage Door Repair Pleasanton to get the best opener for your door.